John WING IV (1681 – 1758) was Alex’s 7th Great Grandfather; one of 256 in this generation of the Shaw line. John Wing was born about 1681 at Wing Island, Yarmouth (now Brewster), Mass. He was the son of John WING III and Mary BANGER. He married Achsah (maiden name unknown) Winslow at Harwich, Barnstable, MA, on 16 Oct 1712. She lived after her marriage, but a short time, for 5 Mar 1713, he married Bethiah Winslow at Harwich, Barnstable, MA. She also died young, 19 Jun 1720, aged 29. For his third wife, he married Mrs. Rebecca FREEMAN Vickerie on 24 Jul 1723 at Harwich, Barnstable, Mass. 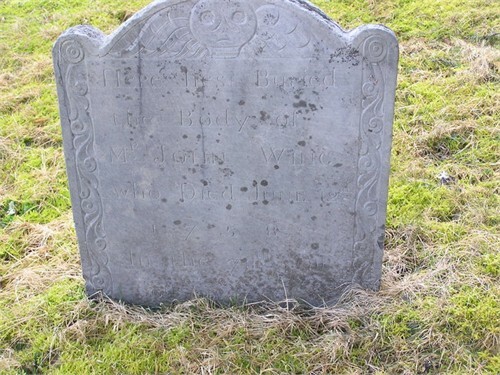 John died at Harwich, Barnstable, MA, on 12 Jun 1758 and was buried at the Old Burial Ground in Harwich (now Brewster). Achsah Winslow was born in 1685. She was probably a widow of Joseph Winslow of Harwich. Achsah died Nov 1712. Bethiah Winslow was born about 1691 in Yarmouth, Barnstable, Mass. Her parents were Kenelm Winslow and Bethiah Hall. Bethiah died 19 JUN 1720 in Harwich, Barnstable, Mass. Rebecca Freeman was born at Harwich, Barnstable, MA, on 26 April 1694. Her parents were Deacon Thomas FREEMAN and Rebecca SPARROW. She first married before 1718 in Harwich, Mass to Joseph Vickery (b. 4 Jan 1690 in Hull, Plymouth, Mass. – d. 4 Mar 1718 in Harwich). Rebecca died after 1 Sep 1761 at Harwich, Barnstable, Mass. John’s father died in 1683, 16 years before his grandfather John WING II whose will is dated 13 Apr 1696 and who died at Harwich, Barnstable, MA, around Apr 1699. His grandfather gave generously to his grandson John in his will. I haven’t ruled out another cousin named John, but I think this bequest was direct to our John WING IV. … “To “my Grand Son John Wing my dwelling house out housings, orchards, yards, lands, meadows that is to say all the third part where I now live (beside Annanias and Josephs) both divided and undivided…only Reserving and my will is that if it so happen that my sd Grandson John Wing die not having an heir lawfully begotten…then all my sd house, lands, meadows and premised Shal be my Grand Son Elnathan Wings and his heirs and assigns. JOHN, the son of John and Mary Wing, married, Oct 16. 1712, Achsah Winslow (probably a widow of Joseph Winslow, of Harwich). She lived after her marriage but a short time, for March 5th, 1712-13, he married Bethia, the daughter of Kenelm Winslow. She also died June 19, 1720, aged 29 and for his third wife he married, July 24, 1723, Rebecca Vickerie. His servant, Jeremiah Joe, “went in Capt Peter West’s company to the war with the French from March 7, 1757, to Feb. 23, 1758, fifty weeks and three days.” He had land on the Cane Pond Neck. His place of burial in the old burying ground at Brewster is marked by a head-stone with this inscription: “Here lies buried the body of Mr. John Wing, who died June 12, 1758, in the 78th year of his age.” His will was dated Nov. 15, 1757, and was proved Aug. 15, 1758. Joseph Wing and his wife Rebecca were his executors, and his estate was appraised at 855 pounds, nine shillings and eleven pence. In the inventory is mentioned some property in a part of a school house. 1.Mercy, born Dec. 25, 1713. 2.Bethia, born Jan. 22, 1715-6. 3.Rebecca, bom March 26, 1718. 4.John, bom June 8, 1720. 5. Hannah born May 7, 1724. 6. Thankful, born Aug. 20, 1725. 7. Phebe, born Jan. 20, 1726-7. 8. Joseph, born Aug. 21, 1728. 9. David,born Aug. 10, 1732. Mercy’s husband Samuel Wing was her first cousin once removed. He was born Aug 1694 in Harwich, Barnstable, Mass. His parents were Ananias Wing and Hannah Freeman. His grandparents were John WING(E) (II) and Elizabeth DILLINGHAM. Samuel died 11 Apr 1774 in Harwich, Barnstable, Mass. i. Hannah Wing b. 15 Feb 1733 in Harwich, Barnstable, Mass. ; d. 17 Oct 1796 Barrington, Shelburne, Nova Scotia, Canada; m. 12 Jul 1753 in Harwich to Elisha Hopkins (b. 1721 in Barnstable, Barnstable, Mass. – d. 28 Dec 1743 in Barrington, Nova Scotia) Elisha’s parents were Elisha Hopkins Sr. and Experience Scudder. Hannah and Elisha had seven children born between 1757 and 1756. Barrington forms the southernmost part of the province and contains Cape Sable, the eastern boundary between the North Atlantic Ocean and the Gulf of Maine. ii. Capt. Edward Wing b. 11 Oct 1735 in Harwich, Barnstable, Mass; d. 7 Feb 1814 Goshen, Hampshire, Mass; m. 7 Aug 1774 in Warren, Rhode Island to Elizabeth Miller (b. 18 Jul 1753 in Warren, Rhode Island – d.2 Sep 1839 in Ashfield, Mass.) Her parents were Benjamin Miller and Hope Cole. Edward and Elizabeth had ten children born between 1776 and 1796. Cole reports that Elizabeth Miller married “Mr. Niles of Conway, Mass.”, while her sister Patience married “Mr. Wing of Ashfield.” However, the will of Edward Wing of Goshen, dated 7 Oct. 1812, names his wife Elizabeth and lists these same children. After her husband’s death, the widow Elizabeth Wing went to live in the household of her daughter Rebecca Clark in Ashfield, Mass., where “Mrs. Elizabeth Wing” died in 1839 at an age which is in reasonable agreement with her birthdate as Elizabeth Miller of Warren, R.I. Thus there seems no reason to doubt that Benjamin and Hope Miller’s daughter Elizabeth actually married Edward Wing and lived successively in Warren, Conway, Goshen and Ashfield. v. Mercy Wing b. 24 Dec 1742 in Harwich, Barnstable, Mass. ; m. 12 May 1763 in Harwich to Jonathan Snow (b. 4 May 1747 in Harwich – d. 3 Mar 1828 in Brewster, Barnstable, Mass.) His parents were Jonathan Snow Sr. and Sarah Bangs. Mercy and Jonathan had three children. Time in Service…………………… M. W. D.
vi. Capt. Seth Wing b. 19 Aug 1744 in Harwich, Barnstable, Mass. ; d. 1801 Pittsfield, Berkshire, Mass. ; m. 16 Apr 1768 in Harwich to Huldah Myrick (b. 10 Nov 1746 in Harwich – d. 12 Jun 1824 in Hinsdale, Berkshire, Mass.) Huldah’s parents were Thomas Merrick and Hannah Hopkins. Seth and Huldah had six children born between 1768 to 1776.
vii. Rebecca “Rebkah” Wing b. 7 Dec 1746 in Harwich, Barnstable, Mass. ; m. 28 Aug 1799 in Dalton, Berkshire, Mass to William Sibley (b. ~1742 Dalton, Berkshire, Mass.) William’s parents were Robert Gladstone Sibley and Mary Louise Kerr. x. Abner Wing b. 14 Aug 1752 in Harwich, Barnstable, Mass. ; d. 11 Dec 1787 Harwich; m. 8 May 1777 Wellfleet, Barnstable, Mass. to Sarah Higgins (b. 11 Feb 1756 in Barnstable, Barnstable, Mass) Sarah’s parents were Jonathan Higgins and Sarah Coombs. Abner and Sarah had three children born between 1778 and 1783.
xi. Elisha Wing b. 3 May 1755 in Harwick, Barnstable, Mass. ; d. 16 Jun 1835 Hinsdale, Berkshire, Mass; m. 6 Nov 1783 in Hinsdale, Berkshire, Mass. to to Anna Boardman (b. 27 Mar 1751 in Wethersfield, Hartford, CT – d. 21 Oct 1825 in Hinsdale) Anna’s parents were Daniel Boardman and Eunice Belden. Elisha and Anna had nine children born between 1784 and 1799. Berthiah’s second husband Elisha Cobb was born 24 Dec 1702 in Barnstable, Barnstable, Mass. His parents were James Cobb and Elizabeth Hallett, Elisha first married 25 Feb 1725 in Barnstable, Barnstable, Mass to Mary Harding (b. 15 Sep 1707 in Eastham, Barnstable, Mass.) Elisha died 11 Nov 1752 in Eastham, Barnstable, Mass. Bangs, Reuben.Private, Capt. Salmon White’s co., Col. David Wells’s regt. ; marched to Ticonderoga May 10, 1777; discharged July 10, 1777; service, 2 mos. 10 days. Roll sworn to in Hampshire Co.
Bangs, Reuben.Private, Capt. Russell Kellogg’s co., Col. Ruggles Woodbridge’s regt. ; enlisted Aug. 17, 1777; discharged Aug. 19, 1777; service, 5 days, on an alarm at Bennington; roll sworn to at Boston; also, Lieut. Kellogg’s co., Col. Ezra May’s regt. ; enlisted Sept. 20, 1777; discharged Oct. 14, 1777; service, 30 days; marched to Stillwater and Saratoga. Bangs, Reuben, Williamsburg. Private, Capt. Samuel Fairfield’s co., Col. Nathan Sparhawk’s regt. ; enlisted Sept. 23, 1778; service, 2 mos. 25 days, at Dorchester. ii. James Bangs b. 1738 in Harwich, Barnstable, Mass. ; d. 1810 Stanstead, Quebec, Canada; m. 10 Mar 1757 in Barnstable, Mass to Susanna Hallett (b. 1738 in Yarmouth, Barnstable, Mass. – d. 1838 in Harwich) Susannah’s parents were Samuel Hallett and Susannah Clark. James and Susannah had twelve children between 1758 and 1783. The family moved to Williamsburg, Hampshire, Mass in the western part of the state about 1770. Bangs, James, Williamsburg. Sergeant, Capt. Abel Thayer’s co., which marched April 21, 1775, in response to the alarm of April 19, 1775; service, 7 days; reported enlisted into the army April 28, 1775; also, Capt. Thayer’s co., Col. John Fellows’s regt. ; muster roll dated Aug. 1, 1775; enlisted April 28, 1775; service, 3 mos. 11 days; also, company return dated Dorchester, Oct., 1775. Rebecca’s husband Lot Chase was born 11 Mar 1716 in Yarmouth, Barnstable, Mass. His parents were Isaac Chase and Mary Berry. Lot died 25 Mar 1749 in Harwich, Barnstable, Mass. His grandparents were our ancestors John CHASE and Elizabeth BAKER. i. Bethiah Chase b. 22 Feb 1740 in Harwich, Barnstable, Mass. ; m. 28 Jun 1762 – Harwich, Barnstable, Mass to Benjamin Lincoln(b. 18 Jun 1735 in Harwich) Benjamin’s parents were John Lincoln and Hannah Hopkins. Major General Benjamin Lincoln was born two years before 24 Jan 1733 in Hhingham, Mass. ii. Lot Chase b. 1750; d. 25 Mar 1754 Hyannis, Barnstable, Mass. John’s second wife Rebecca [__?__] was born in 1724. Hannah’s husband Samuel Bangs was born 23 Sep 1722 in Harwich, Barnstable, Mass. Hannah’s sister Bethiah married Samuel’s brother James. Their parents were Jonathan Bangs and Experience Berry. His grandparents were John Bangs and Mary Mayo and his great grandparents were our ancestors Edward BANGS and Rebecca HOBBART. Samuel died 1 Mar 1787 in Oblong, Dutchess, New York. Putnam County was slow to be settled compared to other parts of the Hudson Valley, for two reasons. Firstly, it was privately owned and settlement was limited to tenent farmers willing to pay a portion of their earnings to Phillipse. Secondly, it was mostly hilly and rocky and unattractive to farmers looking for tillable cropland, and therefore was limited to dairy farming and wood cutting. The first non-tenent settlers in the county were along its eastern edge, due to an ambiguous border with Connecticut, which attracted farmers from New England, who presumed that the disputed area was not owned by Phillipse. The problem with the Connecticut border is that the colony of New York claimed roughly 20 miles east of the Hudson River, but the river veers slightly to the west in the Highlands. Thus, the eastern roughly 2 miles of the county (and parts of Dutchess and Westchester counties) were in “The Oblong”, the narrow band thought by some to be in Connecticut. The first village in the county was Fredericksburg, now the hamlet of Patterson. The border dispute was solved after the Revolution, and the heavily settled oblong was incorporated as the first of two versions of the Town of Southeast, named thus as it was the southeasternmost town in Dutchess County. Due to the increasing population of Dutchess County and the great distance from its county seat, Poughkeepsie, Putnam detached from Dutchess in 1812, and created its own county with Carmel as the seat. Wilson, New York; m. 1768 in Mass to Sgt. Ebenezer Hartwell (b. 1746 in Carmel, Putnam, New York – d. 2 Apr 1813 in Castleton, Rutland, Vermont; Burial: Congregational Cemetery ) Ebenezer’s parents were Peter Hartwell and Mary Coleman. Hannah and Ebenezer had 15 children born between 1767 and 1795. Ebenezer was a sergeant in the Revolution. i.Judith Jenkins b. 1752 in Harwich, Barnstable, Mass. ; d. 7 Sep 1831 Brewster, Barnstable, Mass. ; Burial: Brewster Cemetery; m. 25 Aug 1778 to Deacon Abner Robbins (b. 10 Jul 1758 in Brewster, Barnstable, Mass. – d. Jan 1842Brewster, Barnstable, Mass; Burial: Brewster Cemetery) Abner’s parents were William Robbins and Hannah Vincent. Judith and Abner had four children born between 1779 and 1790. In the 1790 census, Amiel was a resident of Hudson, Columbia, New York with two females and one boy in his household. Phebe’s husband Nathaniel Foster was born 17 Apr 1725 in Harwich, Barnstable, Mass. His parents were Deacon Chillingsworth Foster and Susanna Grey. After Phebe died, he married in 1770 to Charity Knowlton (b 1730 in Bedford, Westchester, New York – d. 1790 in Dutchess, New York). He third married Rebecca Vickery. Nathaniel died 1787 in Danbury, CT.
Nathaniel was a Corporal in the American Revolution. i. Nathaniel Foster b. 1748 in Brewster or Harwich, Mass. ; d. 9 Oct 1795; m. Lydia Crosby (b. 1746 in Harwich, Barnstable, Mass) Lydia’s parents were Joshua Crosby and Lydia Hopkins. Nathaniel and Lydia had five children born between 1780 and 1791.
iii. Ruth Foster b. 1750 in Southeast, Putnam, New York; d. 1 Oct 1816 Southeast, Putnam, NY; Burial: Old Southeast Church Cemetery; m. 1764 in Mass. to Abner Crosby (b. 25 Dec 1744 in Harwich, Barnstable, Mass. – d. 5 May 1813 in Southeast, Putman, New York; Burial: Sears Burying Ground, Southeast [Doansburg]) Abner’s parents were David Crosby (b. 13 Apr 1709 Harwich, Barnstable Mass. – d. 20 Oct 1793 Southeast, Dutchess, New York) and Reliance Hopkins (b. 24 Jul 1715 Harwich – d. 25 Feb 1788 Southeast, Dutchess, New York_. Ruth and Abner had at least five children born between 1768 and 1797. Abner served in the American Revolution. iv. John Foster b. 15 Nov 1751 in Oblong, Dutchess, New York; d. 2 May 1823 Hancock, Berkshire, Mass; m. 1773 in Connecticut to Deborah Elwell (b. 1752 in Connecticut – d. 15 Sep 1829 in Hancock, Mass.) John’s sister Phebe married Deborah’s brother John. Their parents were Jabez Elwell and Tabitha Jones. John and Deborah had six children born between 1773 and 1790.
v. Phebe Foster b. 1755; d. 1805; m. 1773 to John Elwell (b. 1755 in Connecticut – d. 1788) Phebe’s brother John married John’s sister Deborah. Their parents were were Jabez Elwell and Tabitha Jones. vi. Thomas Foster b. 1756 in Oblong, Dutchess, New York; d. 9 Jul 1832 Calais, Washington, Vermont; Burial: Fairview Cemetery; m. 6 Apr 1780 in Kent, Litchfield, Connecticut to Hannah Bliss (b. 9 Jun 1754 – d. 5 Apr 1841 Burial: Fairview Cemetery, East Calais) Thomas and Hannah had eight children born between 1780 and 1795. Thomas served in the American Revolution. Sergeant Thomas Foster enlisted in the Revolutionary army–in the Connecticut militia–and served through the war. Part of the time he was sergeant of his company. Soon after the war he moved from Kent, Conn., to Vermont, locating in Strafford; followed farming and later moved to Calais. March 4, 1831 he was granted a pension for Rev. war service, and paid $93.30 for back pension. He made an application for pension on April 2, 1818, at which time he was sixty-two years of age, and residing at Calais, VT, and his pension was allowed for eighteen months’ actual service as a, private and sergeant in the New York troops. He served under Capt. William Pierce and Colonel Swartwout. Place of his enlistment not stated. His widow, Hannah, made application and, received a pension for the service of her husband as stated above. Thomas Foster’s name appears on the Roll of Enlisted Men in the Regiment of Minute Men, Duchess County (N.Y.) Militia, Col. Jacobus Swartout, Commander. vii. David Foster b. 1758 in Danbury, CT; d. 3 Jan 1821 Williamstown, Berkshire, Mass. ; Burial: Westlawn Cemetery; m. 1781 in Williamstown, Mass. to Susanna Lydia White (b. 1756 in Fishkill, Dutchess, New York – d. 20 Apr 1828 in Williamstown, Mass. ; Burial: Westlawn Cemetery) Susanna’s parents were John White and Tabitha Ellis. David and Susanna had ten children born between 1784 and 1802. David fought in the Revolutionary War as a Private in New York, Dutchess County Militia, 3rd Regiment, enlisted. Source: Dutchess County Militia, Regiment of Minute Men. His gravestone is marked by the “Soldier in the Revolutionary War” signia. The stone is located at West Cemetery, Williamstown, MA. Also noted in “Foster Genealogy” pg. 562. Fought under Cols. Henry Ludenton and Jacob Swartout. (New York), Pvt. Field’s Co., 3rd Dutchess Co. Reg., N.Y. Millitia, Rev. War. Joseph’s wife Experience Hopkins was born 1729 in Chatham, Mass. Her parents were Elisha Hopkins and Experience Scudder. Experience died after 1800. According to John Wing and his Descendants, Joseph built a house upon the place where the late John Atwood lived. He died not far from the year 1800.” He was a man of much humor, and finally became somewhat dissipated in his habits. i. Reliance Wing b. 28 Jul 1750 in Harwich, Barnstable, Mass. ; d. 27 Dec 1795 Harwich, Barnstable, Mass; m. 16 Nov 1769 in Harwich to Reuben Snow (b. May 1748 in Harwich – d. 17 Dec 1795 in Harwich) Reuben’s parents were Nathaniel Snow and Thankful Gage. Reliance and Reuben had ten children born between 1770 and 1795 in Harwich. ii. John Wing b. 4 Jun 1754 in Harwich, Barnstable, Mass. iv. Obed Wing b. 20 Nov 1758 in Harwich, Barnstable, Mass. whose parents were Joseph Wing and Mehitable Hatch. This Obed married Deliverence Wing and died 15 Mar 1789 in Sandwich, Barnstable Co., Mass. Wing, Obed, Sandwich. Private, Capt. Joshua Tobey’s co.; enlisted July 12, 1775; service, 6 mos. 4 days; also, list of men belonging to Capt. Abijah Bangs’s co. raised from various towns in Barnstable Co., dated Dorchester, Sept. 4, 1776; also, Corporal, Capt. Bangs’s co., Col. Dike’s regt. ; pay roll for travel allowance from home and return, etc., dated Boston, Nov. 26, 1776; credited with allowance for 3 days travel; mileage for 120 miles to and from camp also allowed; also, Private, Capt. Joseph Palmer’s co., Col. Josiah Whitney’s regt. ; arrived at camp May 16, 1777; discharged July 12, 1777; service, 2 mos. 3 days, at Rhode Island, including 7 days (150 miles) travel to and from camp; company raised to serve for 2 months; roll dated Camp at South Kingston; also, Corporal, Capt. Ward Swift’s co., Col. Freeman’s regt. ; service, 10 days, on an alarm at Dartmouth and Falmouth Sept. 6, 1778; also, Private, Capt. [p.612] Benjamin Godfrey’s co., Maj. Zenath Winslow’s regt. ; service, 6 days, on alarms at Bedford and Falmouth in Sept., 1778; also, Capt. Matthias Tobey’s co., Lieut. Col. Hallet’s regt. ; entered service July 30, 1780, 3 days preceding march; discharged Nov. 2, 1780; service, 3 mos. 7 days, at Rhode Island, including 3 days (53 miles) travel home; regiment detached to reinforce Continental Army for 3 months. v. Thomas Wing b. 24 Nov 1762 in Harwich, Barnstable, Mass. vi. Edward Wing b. 26 Nov 1764 in Harwich, Barnstable, Mass. vii. Levi Wing b. 3 Aug 1767 in Harwich, Barnstable, Mass. ; d. 22 Jun 1827 Chatham, Barnstable, Mass; m. Elizabeth Howes (b. ~1763 in Chatham, Barnstable, Mass – d. 09 Sep 1837 in Chatham) Levi and Elizabeth had three children born between 1797 and 1804 in Chatham. viii. Rebecca Wing b. 14 May 1770 in Harwich, Barnstable, Mass. According to John Wing and his Descendants, the Probate Courts of Harwich make him the first in the order of four brothers, viz: David, Thomas, Joseph and John; but the town records of births give the order and dates as we have given them this way. He is said to have had a residence, for a time at least, in Dennis, Barnstable county, Mass. The father, David, died about 1806. This entry was posted in -9th Generation, Historical Monument, Line - Shaw and tagged Harwich. Bookmark the permalink.